Hello everyone and welcome! 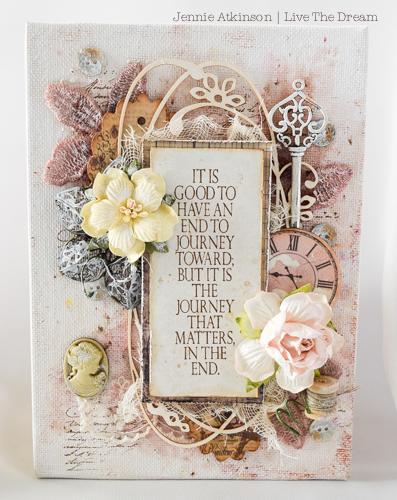 Nikki here, hosting our new challenge at A Vintage Journey. Our theme this month is 'Canvas'. 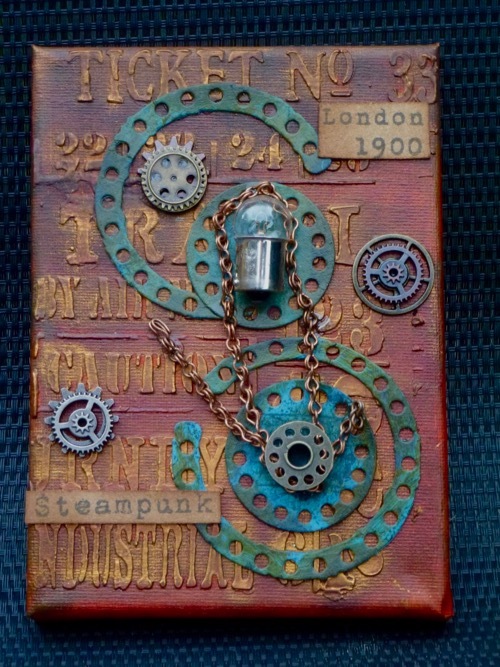 Let's work with canvas in our vintage; shabby; mixed media, art journalling, industrial, timeworn or steampunk style. It doesn't matter how as long as some canvas is a dominant feature of your project. 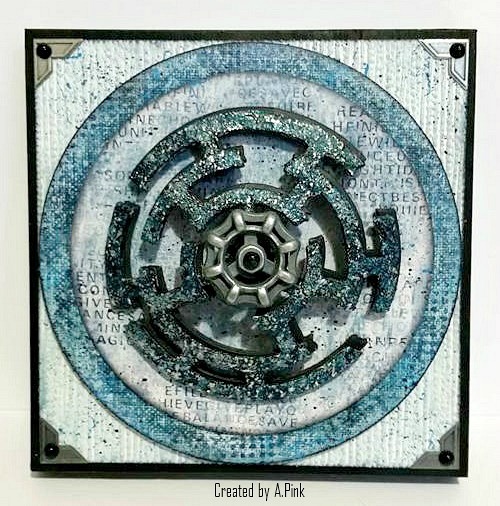 Perhaps you may use a canvas in the traditional way or use the reverse to create a shadow box? Canvas boards are fabulous to work on or perhaps you have some canvas sheets which can be cut and adhered to another surface. Once again we have a wonderful sponsor this month - Shimmerz Paints. The randomly chosen lucky winner will receive a $25 voucher to spend in their store. The Creative Guides also pick their Top 3 who become our Pinworthies who have their work pinned in our PINTEREST gallery, this could be you next month. 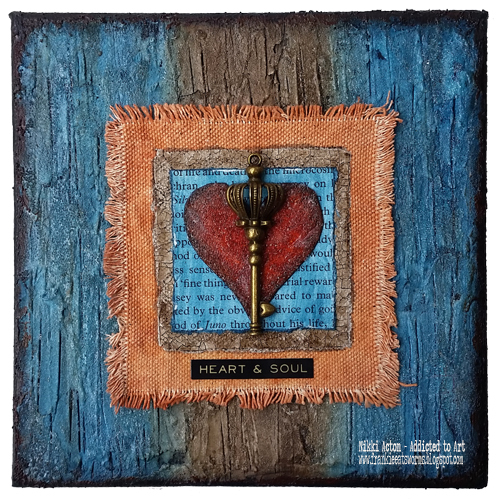 I recycled a previously used 6 x 6 inch canvas for this project and created a very textured surface using a number of mediums. Canvas was used for one of the additional layers too. Lots more details and pictures over at Addicted to Art today. I decided to use a primed canvas board for my project as I planned to use a number of layers of heavy embellishments and they needed a good strong support. This is one of my favourite quotes so I thought I would let it have centre stage and cram my embellishments in, around and under it! There are more details over on my blog so do join me if you would like to see how this canvas panel came together. 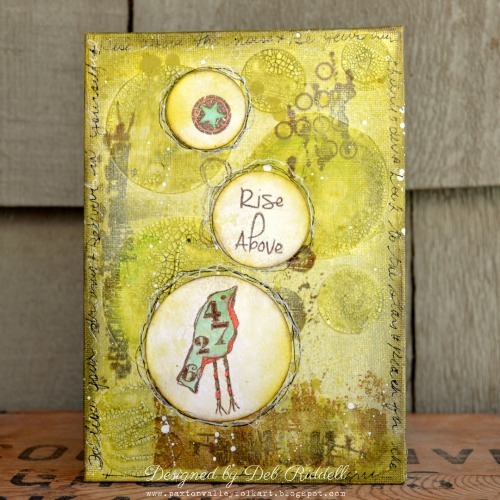 Nikki's theme of 'Canvas' provided the perfect opportunity for me to break out our very own Tracy Evans' new stamps for my Rise Above mixed media canvas! Visions of soda bubbles and that wonderful phrase inspired my circular motif, I've some step out photos on my blog and hope you can pop by for my how to. I opted for a canvas full of texture and layers giving a real tactile feel. I created this over several days, taking time to add layer over layer to give depth to my design. 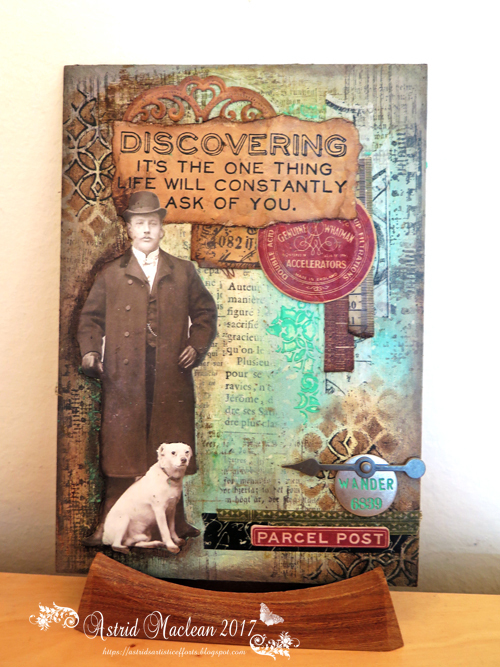 This was a fun piece to create and If you would like to see all the textural details, please pop by my BLOG. 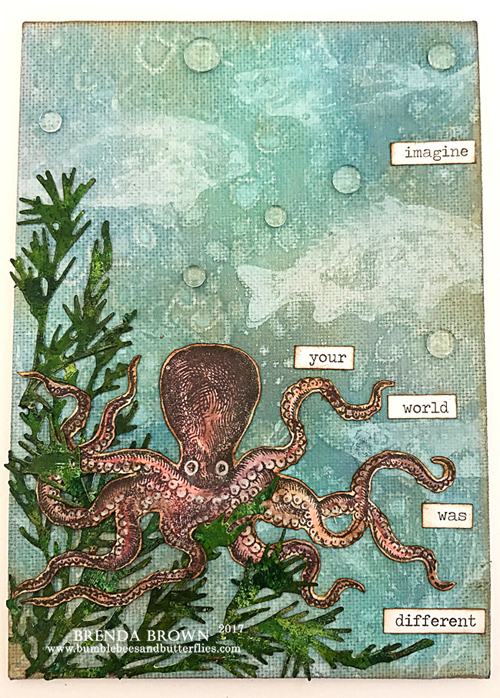 I recently attended my Goddaughter Eden's dance recital and I wanted to make her something special to remember the night - so I decorated this little 2 1/2" x 3 1/2" canvas with DOX inks and lots of Idea-ology pieces. 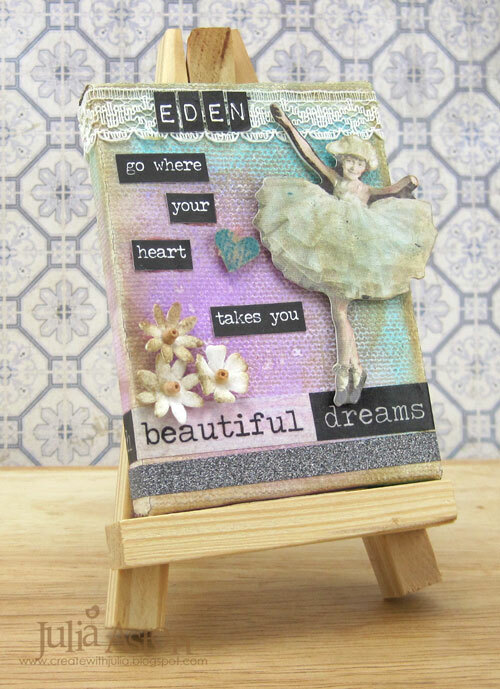 Please stop by my blog for more details on how I put this together for Eden! Summer will soon be officially here and it's time to celebrate the season. As a kid I always looked forward to a carefree time when school was out for awhile. My small canvas was repurposed to bring back happy thoughts of those times. 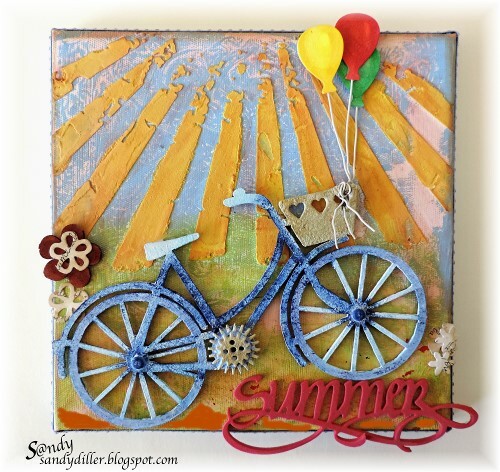 Stop by my blog - My "Crafty" Life on the Internet - for more details. Despite having a large collection of canvases in a whole range of sizes amidst my art stash (I'm Amanda and I'm a canvas collector, hahaha) I decided not to disturb the "pack" so to speak and instead used canvas sheet on my Broken Maze, Hidden Gem creation. There are more details and some 'close ups' on my blog if you fancy stopping by. I love using 5 x 7 canvas boards and thought this would be the easiest way for me to do a project this month whilst I am still doing all my art sitting/laying on the sofa. I loved playing with doxides and even managed to die-cut the greenery myself. More photos and process steps are over on Bumblebees and Butterflies if you would like to see how this watery background came about. I hope we have inspired you and look forward to seeing your creations this month. You can link up your entries below for a chance of becoming a Pinworthy or to receive our sponsor's prize. As there are 5 Fridays this month - this challenge runs until Thursday July 6th. Each canvas is differently wonderful showing how our styles are so different yet delightful. Great job team!! Oh, WOW!!!! Ladies, you have really outdone yourselves this month with all these amazing pieces of artwork! Every canvas so unique and worthy of a fine art gallery! Can't wait to get around to see each one up close on your blogs! Great big BRAVO to my teamies! Such a fabulous gallery of Canvas Projects Everyone. Looking forward to blog hopping later . So much inspiration! All of them so wonderful and different!